Jim Caffrey is a photographer, Photo Tour Guide, and teacher based in Jemez Springs, New Mexico, where he has lived for the past thirty-five years. He has spent much of that time exploring and photographing the hidden and unique landscapes that the Land Of Enchantment has to offer. 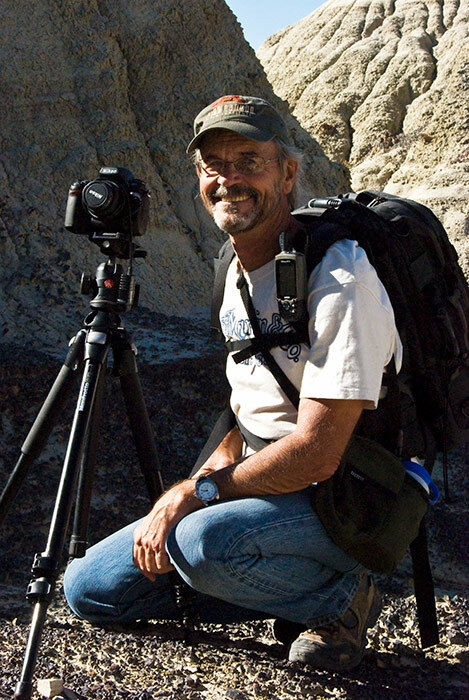 Jim also teaches Beginning and Advanced Digital Photography at UNM’s Los Alamos campus. http://sofiesdiary.com/about/ has nominated me for the Very Inspiring Blogger Award. In turn I would like to nominate you for the same award. Thank you Patricia, and I gladly accept. Thank you also for your kind words. Awesome photos Jim! Keep doing this great job. beautiful photography! I look forward to see and read more from you in the future. Thanks Dina. I’m glad you like my work. Excellent photographs! You have captured the essence of the area. Jim, would mind if I put your images of the Mesa de Cuba Badlands on my website? I would also be interested in talking to you about featuring you on my site as an artist talking about your work. Do you sell copies of your pictures? I like the “Ancient Ones”. Thank you Mia, and thanks for the ping back. Wow! You’re photos are awesome! I don’t think I’ve ever seen a better deer photo than the one you took in your backyard! Hello! Your images are stunning! Are any of them for sale? I would LOVE to feature some in my home. Thank you for sharing your talent with the world!! Yes, they are for sale. Check out my website: http://www.jimcaffreyimages.com. You can order from the site, but it might be easier to email me: jimages3@mac.com and let me know which image or images and what size.